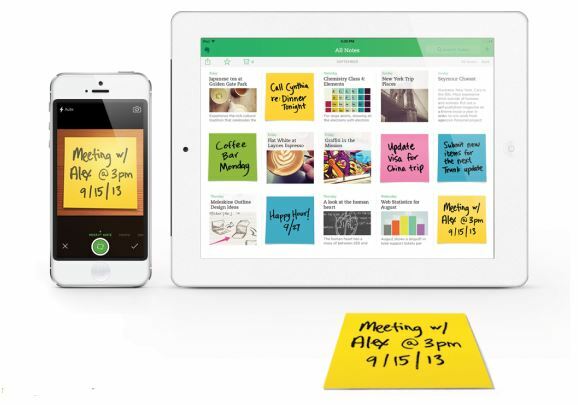 Digitize your paper Post-it notes with Evernote. For real. Magic! As much as I use my phone for list-making and note-taking, there’s nothing like a good old Post-it note that just gives you a glaring reminder of things you still need to do. I have Post-it’s all over my desk, kitchen and computer. So imagine how excited I was to hear that these little helpful slips of paper can be digitized in Evernote for digital reminders of my to-dos. We have long been fans of Evernote’s ease-of-use and the way in which it can help you organize, categorize, save images, tag images, record messages, save emails and more. But now that there is a feature in the Evernote app for iOS 7, which lets you take photos directly of your hand-written notes and digitize them (works with Android and Windows phones as well!). What’s even smarter is that you can color-code the notes to correlate to a specific action; yellow could be bills to pay, blue could be this week’s shopping list. When you assign a color to the Post-it, the app will categorize them digitally and do the organizing for you. Or you could own certain colors and your partner or kids could have the other colors, so you know at first glance what the joint to-dos are. The one catch: While the app will digitally capture any hand-written note, to take advantage of the cool color coding categorization, you need to use the Post-it Products Evernote Collection, which you can find at office superstores nationwide and via the Post-it site. You can also search the notes for things you have already written: Who did I need to get that birthday gift for? What did the husband need from CVS, again? It’s so wonderful to see how my old-school way of taking notes is now taking a big leap into the digital world. The product shown above is the Post-it Note Holder, Quad and it can be purchased online for $29.95 from retailers like Staples, OfficeMax and our affiliate Amazon. The Evernote app is also available for free in iTunes, Google Play and the Windows App Store. Additional features like adding a PIN to your account and taking notebooks offline can be purchased in-app as an Evernote Premium account for $4.99/month or $45/year. I use Evernote and have used the post-it note feature without buying the special ones. I have standard yellow and blue post-its and when scanned by Evernote they do get filed into their own (separate) Evernote notebooks. It is really a great feature! We are losing endangered forests around the world due in a large part for paper. In fact, about 30% of our trees logged in the U.S. are logged for paper. Unfortunately, 3M is misleading consumers into thinking its products are not destroying our forests by using paper products certified by Sustainable Forestry Initiative (SFI). SFI is an industry scam that allows clearcutting of forests and does not even have tree replant requirements. I encourage 3M—and other paper product companies—to dump SFI. Consumers interested in protecting our forests can look for the Forest Stewardship Council (FSC) logo or look for 100% post-consumer paper products.